The application process is the initial process in the AEO Authorization process and is initiated by the AEO applicant that applies for AEO status. Dubai Customs will then validate the completeness of the application as well as performing validation on the eligibility of the applicant. The process ends either with an approved application, which then can continue to the validation sub-process, or with a denied application. In both cases the AEO applicant is advised and informed of the outcome. 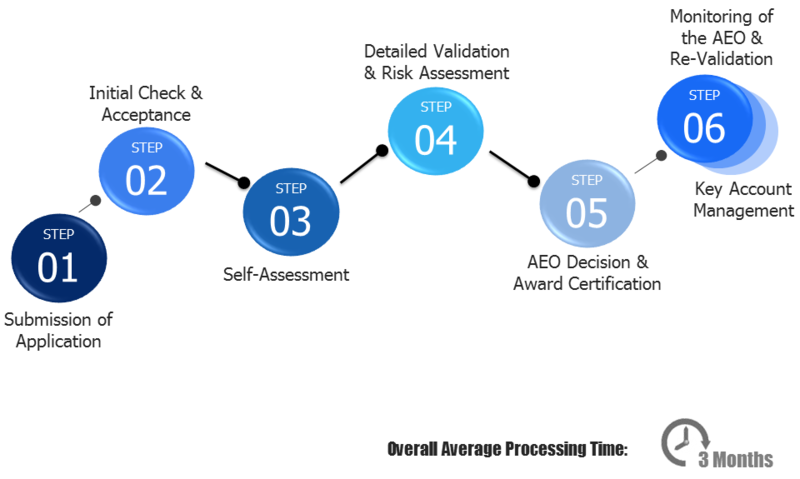 The first part of the AEO validation process is the SAQ-phase. The applicant will be presented to and obliged to analyze, complete and submit a SAQ, tailor-made for the specific type of business the applicant is involved in. The AEO validation team assigned composes the tailored SAQ that is appropriate for the applicant. In a meeting with the applicant, the possible facilitation benefits and their advantages will be explained as well as the business’s requirements and how to manage the SAQ. Information will be collected to consider which facilitation/benefits are most appropriate for the applicant and its activities. This initial step should provide good insight into the applicant’s supply chain activities. After the SAQ is completed, validation team collects and assesses all available and relevant information, including intelligence information that is provided by the AEO Intelligence. This is base for the initial risk assessment. Risk assessment is necessary to find out the strengths and the weaknesses of the AEO applicant and all the areas to be covered by the validation process. After approval from the AEO Manager, the validation is initiated. During the validation assignment,information is gathered from various sources and analyzed. Site visits are performed in order for the AEO validators to study and validate the processes, systems and the premises of the AEO applicant. Building networks with key institutions within and outside the own agency to be able to help the business receiving the correct information and thus foster compliance. The purpose of the re-validation process is to validate and ensure that the AEO is compliant with the AEO criteria defined by DC. Re-validation can be planned or initiated from the monitoring and management process, in case any new risks or deviations are identified. In either way, the scope of the re-validation can be full, in a similar manner as validation, or partly where focus is given on specific areas. The re-validation involves the same process, reports and governance as defined in the validation process, even though the scope will vary. When the decision has been made by the AEO Management that certification is possible, a dedicated AEO Key Account Manager (KAM) is assigned and the KAM issues the certificate and the certification details are entered in the CMS/ECR. It has to be taken into consideration, with regard to the compliance management strategy, how and by whom the certificate will be awarded. The certificate is a compliance motivator. It stimulates the mutual trust and it stipulates that their AEO status is not a free benefit.